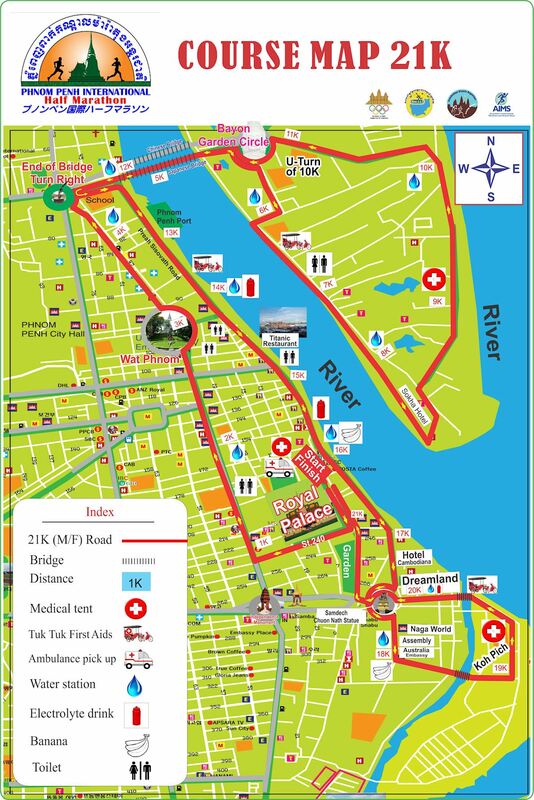 The annual Phnom Penh International Half Marathon will be held Mid June, with the exceptional starting and finishing place in front of the Royal Palace beside the famous Mekong river. This annual event is celebrating the Birthday of Queen Norodom Monineath Sihanouk and conjunction with the World Environment Day as well as commemorate the 124th Olympic Day. Our slogan also run for support Kantha Bopha Children’s Hospitals and for the Green city to improve human well -being and friendship. By this opportunity, we would like to invite international and national runners, supporters to join in the important events. Your participation will certainly bring the great success to this event! See you soon! Every 2km the water station was set up for delivering water to each runners and our volunteers will distribute the water all runners when needed. The top three finishers of Half Marathon (21km) and 10km Race category will be received trophy of winners 1st, 2nd, and 3rd. All prizes must be claimed on the day of the race, the organizers will be mail any unclaimed prizes to runners failing to collect them on the race day. Finisher medal will be provided for Half Marathon and 10km. Half Marathon - 3 hour, 10.5K - 1 hour 30 mins & 3K 45 min. Bananas and energy drinks would be provided at the finish line. This was my first ever half marathon - glad I was able to complete. Would have appreciated if they officially announce the timings of all finishers. This was my first ever half marathon - glad I was able to complete. Would have appreciated if they officially announce the timings of all finishers. The courses are run the streets of Phnom Penh city which along riverside and while part of the Royal Palace will be reserved for participants with the local authorities managing the roadways and intersections, runner are still urged to use caution while the course, as you will likely encounter some traffic and also enjoy to see the activities of local people doing in the morning time along the running course.